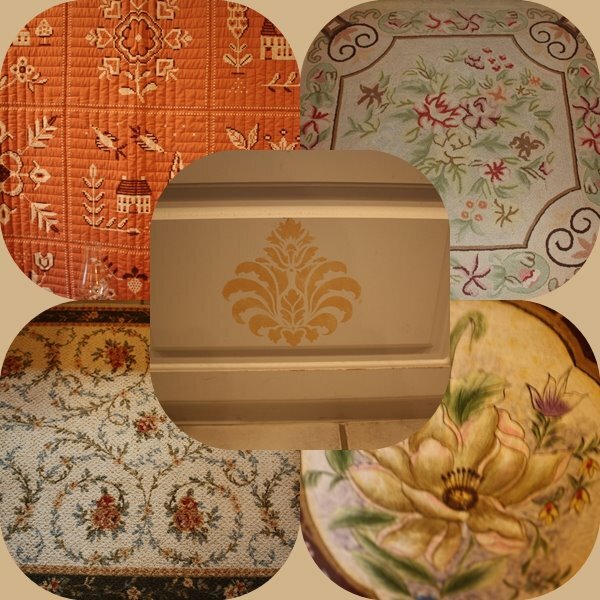 BARGAIN DECORATING WITH LAURIE: DO YOU NEED TO POWDER YOUR NOSE? DO YOU NEED TO POWDER YOUR NOSE? Weeks ago, when I posted some pictures of my master bedroom, I told ya'll that I had used the former living room for the master bedroom. A commenter (and I'm so sorry I can't remember who) asked what we did about the master bathroom, since there would not have been one in proximity to the living room. We were fortunate that there was a bedroom with a small bath next to the living room, so we converted the bedroom and bath into a master bathroom. It has taken me awhile to work up the courage to post pictures of the master bathroom. For some reason, it is a complete departure from the way I normally decorate a room (if you can call what I do decorating). No, that doesn't mean that there isn't a lot of clutter in the bathroom. Before we moved into this house, we had never had a real master bathroom. 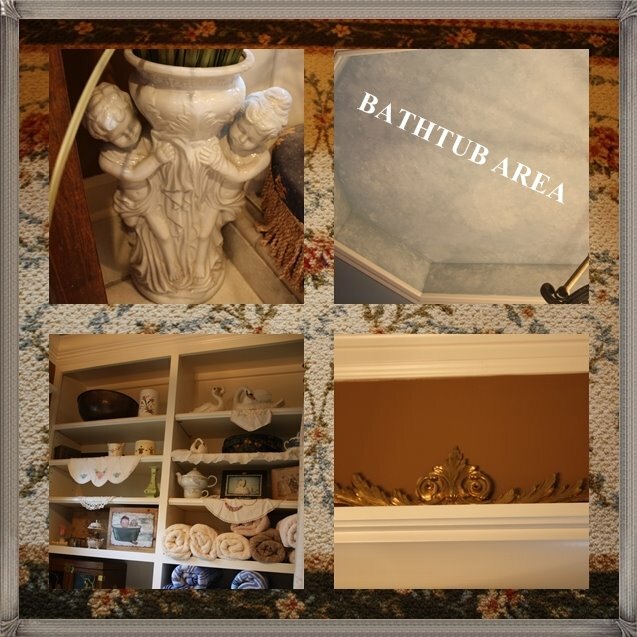 I had envied other people's beautiful master suites for so long. This was really exciting for me, and I got carried away with thoughts of a gorgeous master bathroom. In my head, I was thinking "classy", but having never done "classy", I just couldn't pull it off. I think in order to "do" classy, you have to BE classy, and unfortunately, I'm not. We love our master bathroom, because it has everything we always wanted in a master bathroom, and I've kind of just quit worrying about what it looks like! (I know, you thought I didn't worry about what any of my house looks like-you're right, I don't really worry about it - until I start posting it on my blog for anyone to come see). As I've said before, if a blogging friend asks me to do something, I'm going to try to oblige. (Yeah, my mother used to say "if one of your friends asked you to jump into the river in December, would you jump?" Yes Mother, I'm afraid I might!) Since the master bathroom consists of 3 rooms (I told ya I got carried away! 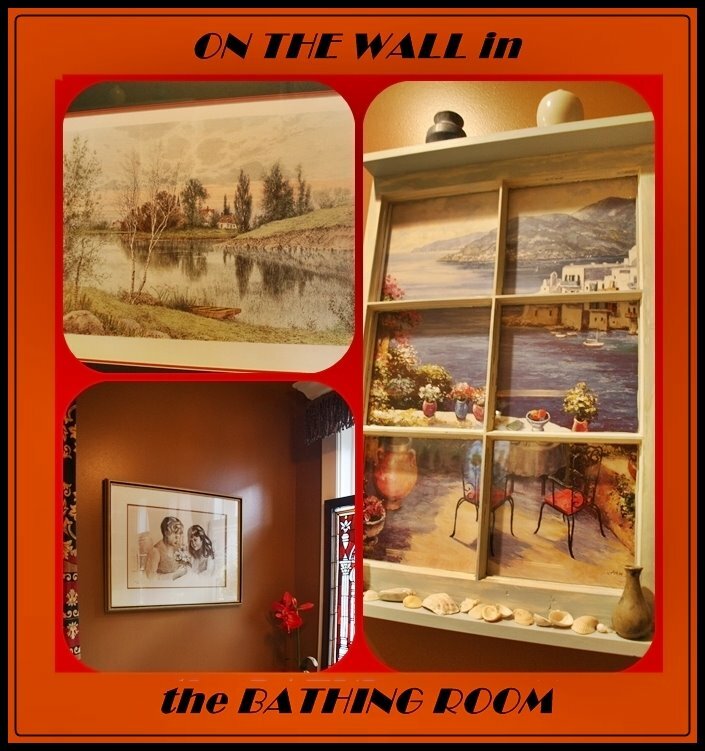 ), I've never really known how to refer to the rooms, but we usually refer to the the room with the tub and shower as the bathing room, and the other two are the "his" and "her" bathrooms. Formerly, in the hallway behind what was originally the living room, there was a linen closet with double doors (did you get all of that?). We took out the linen closet and used the double doors as the entrance to our bedroom. We did add a door in the hallway that can be closed to seclude the master suite from the rest of the house. I bought the painted window shade at a flea market years ago and never used it. When we moved into this house, I was determined to use it, so it went in the center window over the tub. I wanted to hide the top of the shade, but I thought that I had enough confusion going on with this window, and I didn't want more clutter (yes, sometimes the clutter even gets to me), and I thought a valance would add clutter. I had bought a big bundle of this long brown fringe trim one time in a sale bin at the fabric store. I had never used any of it either. I wrapped a curtain rod with fabric and hot glued the fringe to the fabric, and used it as a valance on the window. Several years ago, my husband and I stopped at an antique store, only to find that it was closed. In the window were some stained glass windows, and I remarked that I'd like to come back some time and measure and price those windows, because I thought they might fit on the two windows over our tub. I was shocked when I received them for Christmas that year. When I asked him if he had measured the windows over the tub, he said that he didn't remember that I had mentioned needing to measure before buying them! Fortunately, they fit! The "shadow" pictures belonged to my grandmother. I think they are called "reverse painting on glass". We have a retirement villge in ouir little town. When someone moves there, they always have too much for their new little house. The word has spread that if a quilt is not moving into the house with somebody, they should call my husband, and he will usually buy their quilt. My husband became a quilt collector after years of rolling his eyes when I bought an old quilt. I'm not sure when we reversed our quilt attitudes, but now HE wants to buy quilts, and I (having run out of room to display or store them, and having seen the price of them skyrocket) am kind of over the quilt buying. This quilt came from one of the retirement village residents, and it was one of those times that I was thrilled that my husband had bought another quilt. When we were remodeling this house, we went to an out-of-town wedding. An hour before the wedding, we spotted a store that sold kitchen and bathroom sinks. We thought we'd just go in and kill a little time while we were waiting to go to the wedding. The store owner had gotten angry with the Kohler Company, and he had all of his Kohler products marked way down to get rid of them quickly! Within an hour, we had purchased four sinks, loaded them into the car and were on our way to the wedding. This is one of those sinks. I am not a "purple" girl, but if there is a sale that good, I can become a purple girl! During the remodel, we replaced the windows in the house, because we were concerned about energy loss. 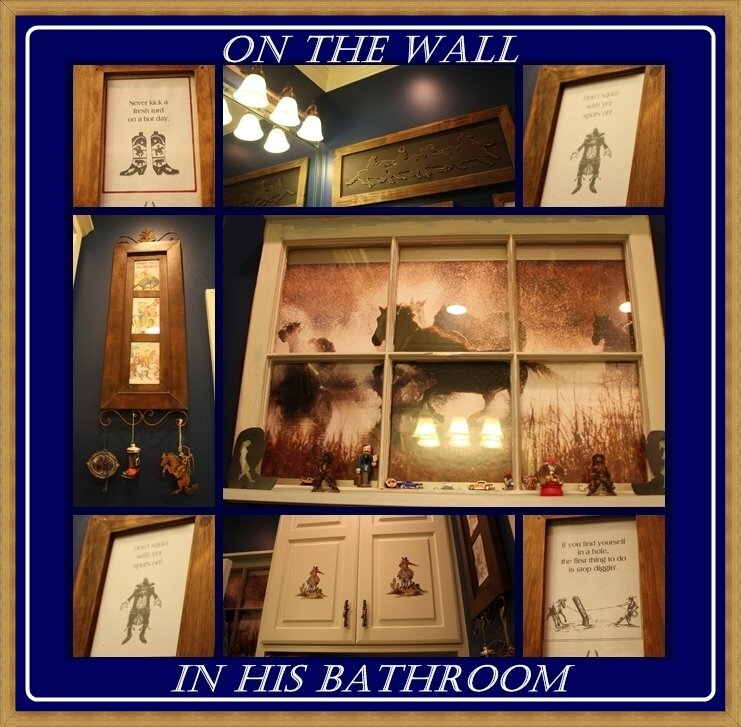 Following a LOT of nagging, my husband finally consented to help me back them with pictures and use them in our bathing room and in his bathroom. I think I have mentioned before that my husband is a wannabe cowboy. Profound wisdom hangs on the walls of my husband's bathroom! 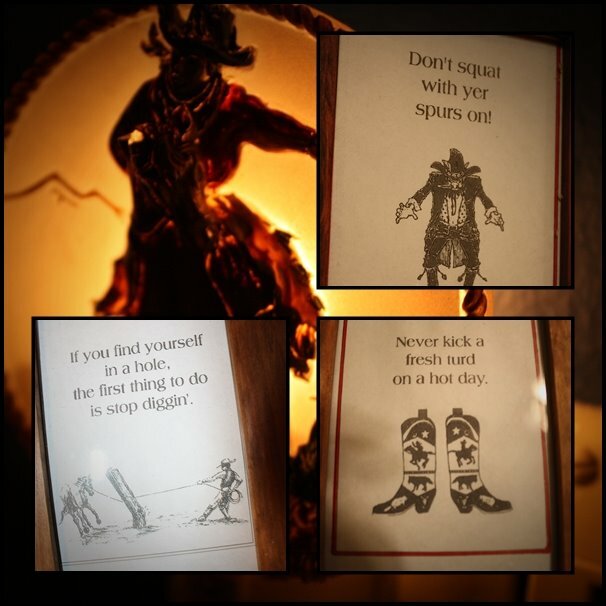 I copied these pages from a book and framed them for his wall. 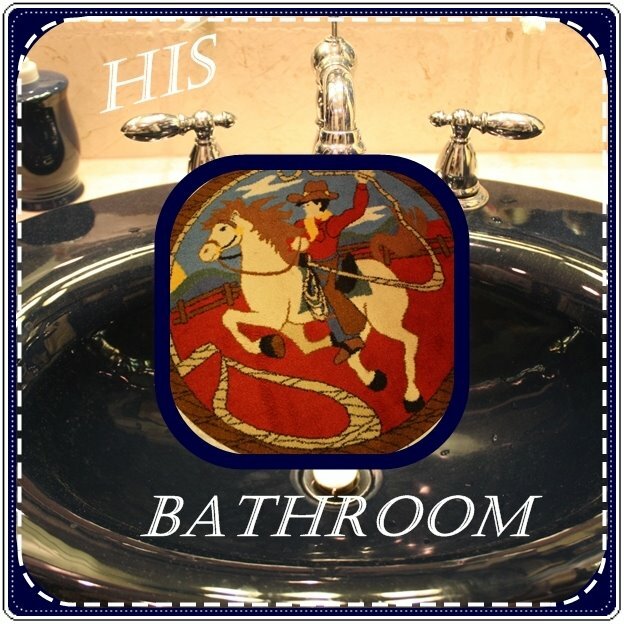 No, his toilet seat does not look like a saddle, but he would probably love it if it did! NOTE: In my previous post, I had a picture of cookies shaped like shoes. Several visitors asked about them. I got that picture from the Flour Pot Cookies website (isn't that the cutest name? ), and I've never ordered (and I sure have never made) them. You must feel like royalty soaking in your bath tub. 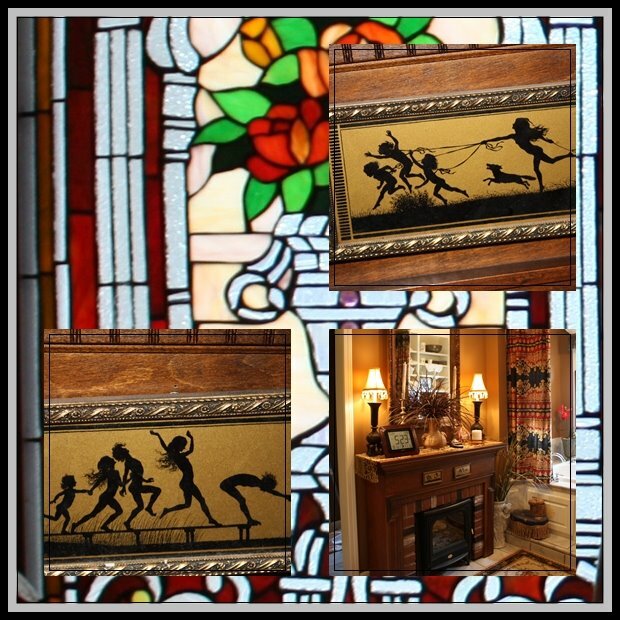 Dear Laurie, I've stopped by for a visit and thought I would make it a quick one ..... but your emerging brilliance as a creator of magic mosaics has blown me away ~ that and the beauty of your home. You, my dear, do in fact have tons of CLASS! BEAUTIFUL! I love what you have done. it is my dream to one day make my room and bathroom bigger. I have 4 out of 6 kids still at home so it may be another 10 years before this happens, but you have given me so much to look forward to. That is unbelievable! You did a great job..and you are MUCH too critical of yourself, my dear! WOWSER - what a bathing suite!! It looks exactly like I would imagine your bath would look like and I mean that in the nicest way possible!! All the little homey special touches just say "Laurie" to me! Loved all your special shoes too - they were great - I didn't participate in that party but will next time. Happy Monday and be sure to come by and enter in my giveaway if you get a chance! Just gorgeous, Laurie.I love the hallway and the brown/white walls. You mosaics are so pretty and especially the ones that are blue with the white. Stunning. I do think I would get lost in there especially in the cave. It probably is easier if you were there. It is certainly lovely. 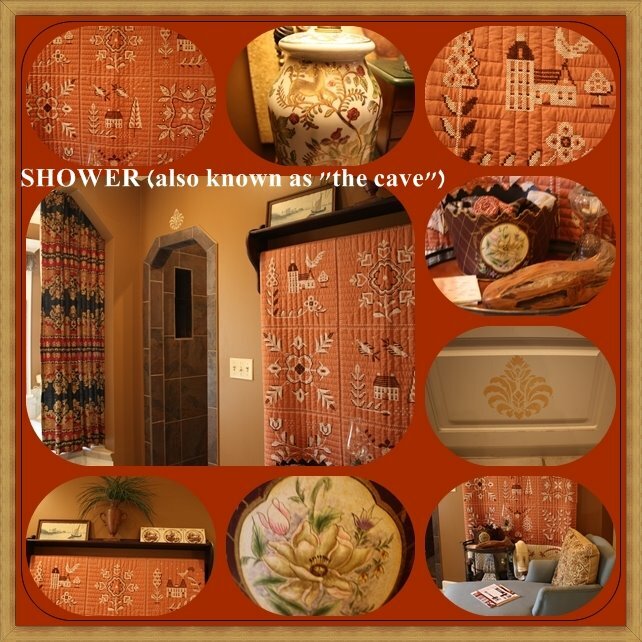 Oh my,Laurie, that is the most luxurious "bathing" room I have ever seen! Thank you so much for sharing. Someone told me that the key to a happy marriage is having a "his and hers" bathroom. You must be one HAPPY couple! It would be my dream to have a bathroom this large -- with "his and hers". This is beautiful! Holy COW Laurie....your bathroom is the size of my whole house! Yowza! I loved the laments on your hubby's wall.......I had to laugh out loud. You're such a fun and cheery gal...and your darling bath reflects that....good for you! forget the visit to powder....I am grabbing a sleeping blanket and I am MOVING IN!!! you did a fantastic job You got your dream bath I assume!!! enjoy! ~WOW! Laurie this all truly fabulous! Amazing job my friend. *Laurie, how absolutely WONNNDERFUL!!!! 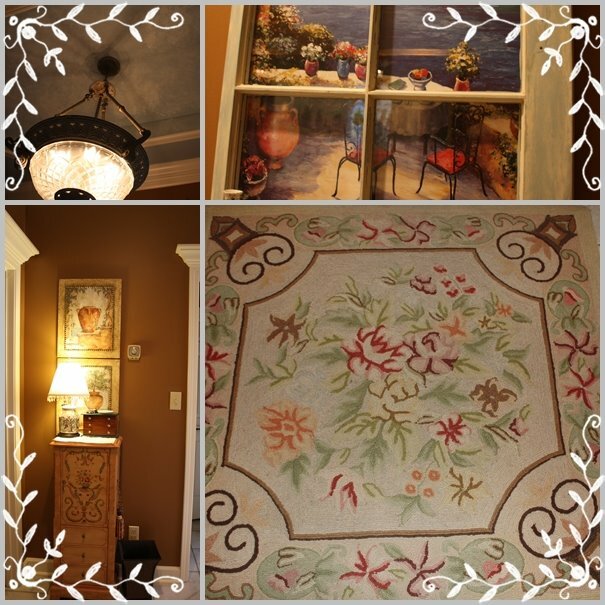 ~~~ These special parts of your home are so very charming, creative, innovative and welcoming... and EVERYthing says "you"... the warmth & love is everywhere! I'm sooo glad I came by! your home is absolutely WONDERFUL! thank you so much for sharing the smiles this morn!! :) Have a GREAT day! 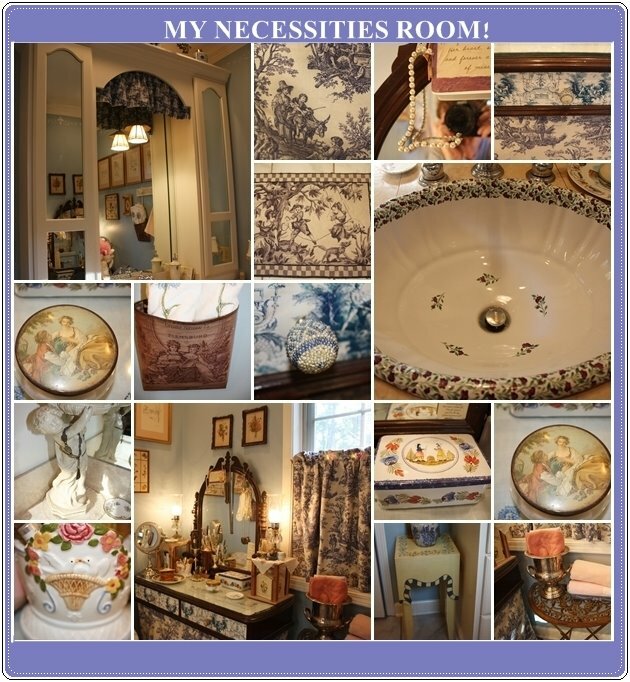 Your bathroom is just like you.....classy, elegant, comfortable, pleasing to the eye, and whimsical. What a beautiful place to soak your worries and aches away. I l♥ve how you can shut the suite off. Thank you for all the prayers for Amy. We do not have a date for the surgery yet. Somehow I missed this one until just now. Thanks for the interesting tour. You have the greatest imagination. I love your home and enjoy seeing parts of it. How beautiful!!! Thank you for stopping by my blog and commenting. I'll be back often.